H.E. Ambassador Philippe J. Lhuillier swore in Ms. Maria del Pilar Lopez Cabrera and Mr. Julio Morales Rodriguez as the new Philippine Honorary Consuls in Las Palmas and Tenerife. Philippine Ambassador to Spain H.E. 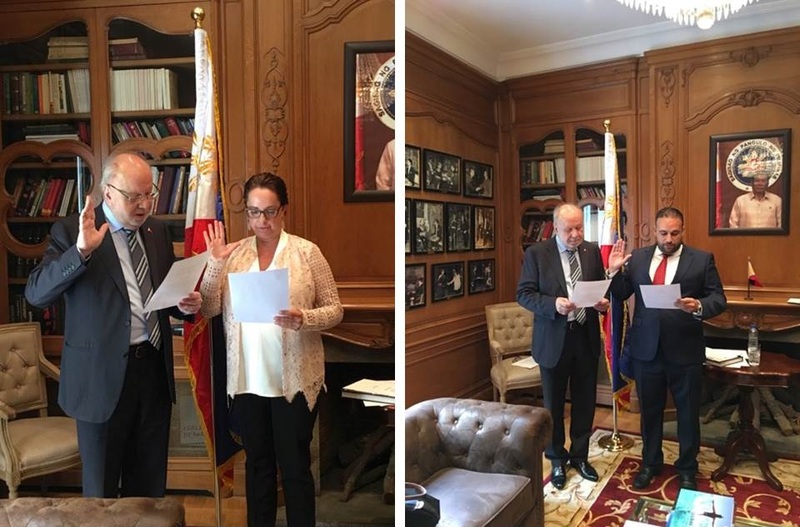 Philippe J. Lhuillier swore in Ms. Maria del Pilar Lopez Cabrera and Mr. Julio Morales Rodriguez as the new Philippine Honorary Consuls for Las Palmas and Tenerife, respectively. The Ambassador underscored the importance of their appointments and encouraged them to uphold their oaths. Ambassador Lhuillier also instructed the newly appointed Honorary Consuls to perform more than what is normally required to protect the interests of Filipinos in their areas of jurisdiction, and to help in the Embassy´s campaign to further strengthen the bilateral relations between the Philippines and Spain. Both Las Palmas and Tenerife are in Islas Canarias (The Canary Islands). The latter is composed of seven main islands, namely: Tenerife, Fuerteventura, Las Palmas de Gran Canaria, Lanzarote, La Palma, La Gomera and El Hierro. It also has other smaller islands and islets. The Autonomous Community of the Canary Islands (Islas Canarias) has a unique governmental structure: the two main islands (Las Palmas and Tenerife) share the capital and governmental seat on rotation basis. There is a large number of Filipinos in both cities. For these reasons, the Embassy proposed the establishment of two (2) Philippine Consulates in the Canary Islands, each headed by an Honorary Consular Officer. This arrangement will facilitate the travel of Filipinos residing in the Western- and Easternmost ends of the islands. This will also enable the two Consular Officers to concentrate on their specific jurisdictions, in addition to allowing the Philippines to have representations to both seats of government. There are around 5,000 Filipinos residing and working in Las Palmas de Gran Canarias and around 3,000 in Sta. Cruz de Tenerife. Ms. Lopez is an entrepreneur in the tourism and restaurant industry, while Mr. Morales is a consultant in a consulting firm. Both have previously worked with Filipinos in their respective areas. Prior to undergoing the intensive two-day training on consular services and briefing on political, economic, cultural, tourism, labor, welfare, administrative and financial concerns, the newly appointed Honorary Consuls were also briefed by Minister and Consul General Emmanuel R. Fernandez on how they could effectively carry out their duties and responsibilities as the representatives of the Embassy and of the Philippine government in general, in their respective jurisdictions. With these new appointments, the Philippine Embassy in Madrid now has a total of eleven (11) Philippine Honorary Consular Officers serving in Andorra, Barcelona, Bilbao, Cadiz, Malaga, Palma de Mallorca, Sevilla, Valencia and Vigo. The formal public opening of the Philippine Consulates in Las Palmas and Tenerife will be announced later.